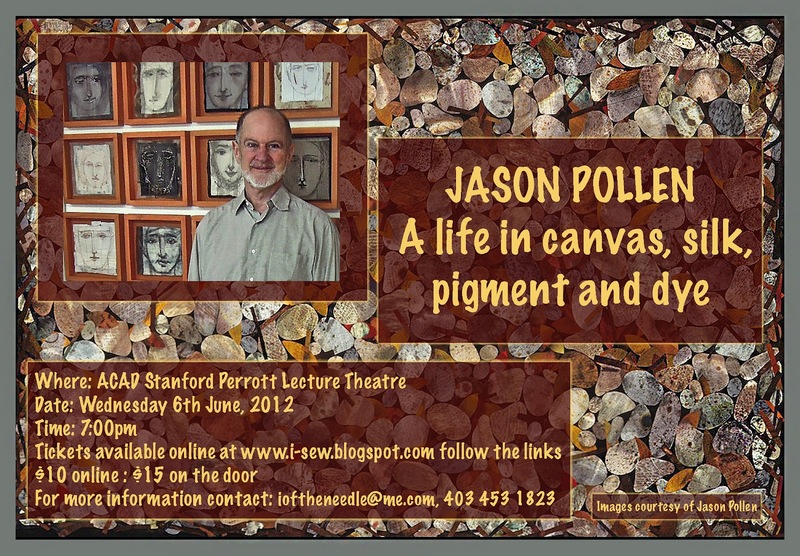 Jason Pollen-A life in Canvas, Silk, Pigment and Dye. 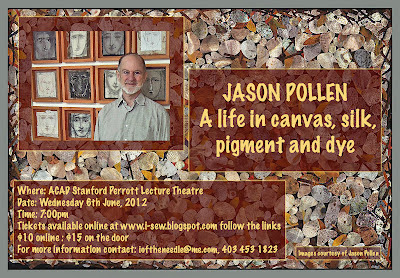 Jason Pollen will be giving his keynote lecture at the Stanford Perrott Lecture Theatre in the Alberta College of Art and Design, Calgary on Wednesday 6th June, 2012 at 7pm. Details below, click to enlarge. IMPORTANT: Please remember to bring your PayPal receipt to the event, it is your proof of purchase. "Jason Pollen was a founding member and for many years the President of the Surface Design Association. He was on the faculty of the Royal College of Art, London, Parsons School of Design and Pratt Institute before serving as Chair of the fiber department at Kansas City Art Institute. Jason exhibits his fabric constructions internationally and is widely known for his innovations in surface design. He has designed textiles for dozens of fashion and home furnishing firms and regularly collaborates as the scenic designer for the Kansas City Ballet. He was named Fellow by the American Crafts Council in 2006. " If you haven't marked the date on your agenda after reading that... then I challenge you to go to Jason's website, drink in the illustrations of his tasty works, and then tell me, do you still have nothing planned for Wednesday June 6th at 7pm? This is a not-for-profit event, entry covers costs: tech staff, equipment and fees.